Welcome to this weeks edition of Crowdleaf’s newsletter. We hope you are all still enjoying this lovely weather! With the world cup well under way, it is heart warming to see fans taking care of their environment and picking up their rubbish after the game is over. This is a fine example of how we should take pride in our home on earth – not just after a great match but for all of our surroundings. Is This The End Of The Yellow All-In-One Recycling Bin? What Does Sustainability Really Mean To The Customer? There is an exponential global risk of growing poverty and displaced people induced by extreme weather, political turbulence and environmental damage many of which are events beyond our imagination. Global warming is taken scientifically as a given, with nearly all scientists agreeing that climate change would happen with or without people’s interference, though to a lesser degree and slower pace. It is therefore safe to say that the climate is not helped by the human populace. The collective lack of preparations to mitigate the effects of global warming are bordering on self-induced mass harm, while the switch to more environmentally friendly policies and clean and sustainable energy is nowhere near fast nor bold enough to provide the alternative. Surely these perpetrators are aware that we are all on the same planet and so far nobody can get off. As of 2013 renewable energy provides 21.7% of all electricity generated across the globe, not enough. This is heading in the right direction but with oil licenses still being given and mines still opening for coal and other fossil fuels the percentage change is demeaned by the negative impact of continued bad practice. Since the beginning of time civilisations have fought and changed, almost evolved as a society often with its back to the wall. A classic example is to think of when man used to live in caves during an ice age, to when societies were formed and measures to stop us killing each other were implemented. Laws that govern societies and progress towards a better level of health and the tackling of the evils of life such as poverty, were met with ambitious targets to alleviate these plights. The issues are now more of regulatory capture of states such as those with powerful fossil fuel lobbies, or an.over reliance on fossil fuels such as OPEC countries. OPEC countries such as Venezuela rely on oil revenues to sustain a response to the other often immediate issues such as poverty or political stability. There are also those who refuse to switch to sustainable energy based on perceptions of how they work, how much they cost and for the classic problem of ‘range rage’ for electric vehicles which is slowly falling due to an increase in battery performance and more super fast charging stations being installed. The relative price of solar or wind is now so good that it is more than competing against alternative or what we have come to call traditional or conventional fuel sources. So I implore you to take one simple message, we can’t carry on like this and if you personally take a stance and take the plunge towards a greener more sustainable world, others will follow. Switch energy provider, divest from fossil fuels and invest in community owned sustainable forms of energy, plant a tree, drive less and walk more. Need I go on? We all know that there is no time to lose, so go green. If your looking for an alternative way to fill a Christmas Stocking or spend money on Black Friday or Cyber Monday try our shop and support the forum as we try to grow and support the green community. CrowdLeaf Store we are doing our own version of Black Friday here early CrowdLeaf, Green Friday and Cyber Monday for us is Clean Monday. Keep an eye on our store for sone pretty amazing world friendly products with discounts for the weekend only. This year marks the 10th year of SuperHomes, the innovative and multi-award winning national network of over 200 homes which have all reduced their carbon footprint by a minimum of 60%. SuperHome owners will open their doors this September as part of our Open House events, and there is a record 100 free events occurring this year across the UK. SuperHomes is a project managed by the National Energy Foundation, an independent charity that aims to reduce the use of energy in buildings. The Open Days are a great opportunity for visitors to see for themselves both the challenges and benefits associated with making older homes more energy efficient, and view retrofit technologies in action. The free Open House events occur every September where the SuperHome owners provide honest and detailed accounts of their renovation stories and offer invaluable advice and guidance. Since 2007 SuperHomes has been at the forefront of domestic eco-retrofit and the network continues to lead the way in carbon conscious renovation. To date, 222 homeowners have all transformed their properties through environmentally minded renovation resulting in lower energy bills, smaller carbon footprints and a huge increase in comfort levels. SuperHomes include all types of houses, ranging from Grade II listed 16th Century ironstone properties to 1990’s build ex-council houses; from 6 bed Victorian mansions to 1940 terraces; from idyllic ecolodge retreats in rural Snowdonia to single story flats in the heart of London. The technology found within and around the properties is innovative and market leading, and our SuperHomes offer exceptional, and often unique, examples of green technologies. In addition to the more mature aspects of green renovation such as external wall insulation, solar PV panels and heat pumps, our houses boast a variety of cutting edge technologies such as Mechanical Ventilation Heat Recovery (MVHR) systems, green roofs, biomass boilers, and even whole house airtight membranes. SuperHomes are pioneers in renewable technology and energy efficiency. We have a number of SuperHomes opening for the first time this year. This includes our most recent addition Pamela whose 1920s ex-Council house in North London is carbon neutral! She achieved this by installing many technologies, including Solar Water Heating, Solar PV Panels and Mechanical Ventilation Heat Recovery. Visit Pamela on 16th/17th September on a free tour. Another interesting first time opener is Paul from Flintshire who retrofitted his 1960s home for under £10,000, and still managed to achieve a carbon saving of 64%! 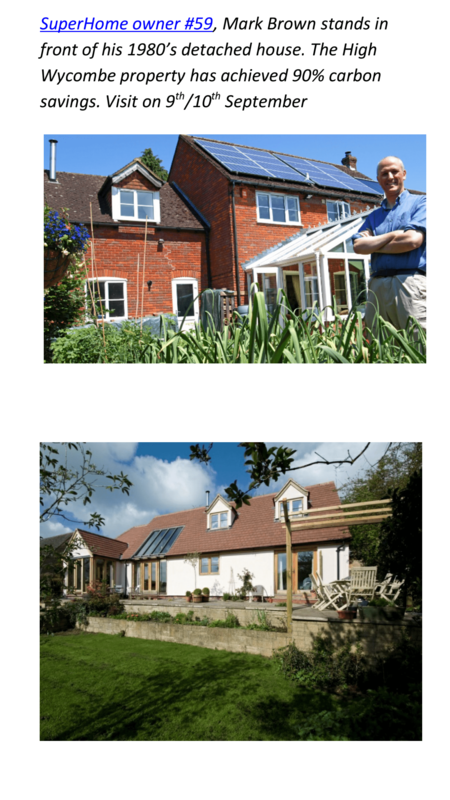 Visit Paul for a tour on the 9th September to learn about how to keep eco-retrofit affordable. To find an Open Day near you please visit http://www.superhomes.org.uk/get-inspired/events/. Energy used in the home accounts for more than a quarter of total energy use and carbon emissions in the UK. Houses in the UK are some of the least energy efficient in Europe, and the majority of the housing stock is made up of older homes which are typically very energy inefficient. Without tackling this problem and improving the energy efficiency of homes we will not be able to meet our emissions target of an 80% cut in emissions by 2050 to meet the requirements of the legally binding Climate Change Act. Open House events like SuperHomes are great ways to distribute knowledge and passion about retrofit, and persuade people to take the carbon conscious decision to reduce energy use in their home. The current, post-Green Deal (the Coalition Government’s flagship energy efficiency policy that was scrapped in 2015), climate, with lowered green incentives and a distinct lack of interest from subsequent governments has seen the focus on eco-retrofit waver. Yet the refurbishment of our homes and buildings is one of the greatest challenges we face to reducing carbon emissions and tackling climate change. SuperHomes harnesses the enthusiasm of our energy saving pioneers to stimulate community-led renovation. To help SuperHomes celebrate this anniversary we’ve partnered with the Ecology Building Society who are supporting this year’s September openings. SuperHome owner #59, Mark Brown stands in front of his 1980’s detached house. The High Wycombe property has achieved 90% carbon savings. Visit on 9th/10th September. We here at CrowdLeaf.org.uk are humbled to be sharing another guest piece, this time from a European level decision maker. As a South East MEP she offers an insider’s perspective on both the problems and solutions for the Environment. All views are that of Anneliese Dodds not CrowdLeaf as an entity. It is no secret that the vast majority of environmentalists supported remaining in the European Union. Nonetheless, those of us who accept the result of the referendum have to somehow ensure that the UK Government now delivers on the aspirations of those who voted to Leave, without completely ignoring the concerns of those who wanted to stay. Last week we finally got an indication of the Government’s negotiating priorities, and it is fair to say that environmental issues received relatively little consideration, with only one paragraph out of 77 pages being devoted to them aside from brief passing references. This differs from the Welsh government’s explicit call for both working and environmental standards from the EU to be retained as part of any post-Brexit settlement. Instead, the UK Government stated that while it would ‘use the Great Repeal Bill to bring the current framework of environmental regulation into UK and devolved law’, this would be followed by the development over time of a ‘comprehensive approach to improving our environment in a way that is fit for our specific needs’- suggesting an (albeit gradual) shift away from current EU standards. In this article I will try and sketch out some of the directions that this new approach could take, in the fields of water and air quality, waste management, climate change, green growth and protection of biodiversity. Although the UK has arguably led the way in some areas of environmental policy, this is certainly not the case when it comes to water and air quality. Indeed, even when covered by EU legislation the UK government has been taken to task by the European Court of Justice for failing to meet standards in both areas. For example, Britain has, last month, been sent a final warning to comply with EU air pollution limits for nitrogen dioxide or it will face a case at the European Court of Justice. £100m to rectify problems with waste water management in Hampshire was provided by the European Investment Bank to Southern Water, and it is unclear whether the UK will be able to remain a member of the Bank in the future and whether this low-interest source of finance will therefore be available. In addition, the existence of EU law has been an important tool to affect the behaviour of the private sector. Hence, the need to meet EU objectives on water quality enabled Ofwat to pressure water companies to invest in projects like the London super sewer. It may prove more difficult to exercise this kind of pressure in the future. When it comes to air quality, while there are UN rules on emissions, specific and enforceable national emissions ceilings (which, incidentally, the UK government recently lobbied to water down), determined at EU level, will no longer apply to us. It is therefore difficult to identify areas where Brexit could enable a scaling-up of action to improve environmental quality. The fact that the UK would no longer be expected to follow the Polluter Pays principle could mean that polluters could, in theory, once more be compensated for measures they introduce to reduce pollution (just as farmers once were for producing nitrates), but such measures may not be politically or pragmatically feasible, nor desirable. On waste management, the picture is a complex one. Clearly EU landfill rules facilitated measures to promote recycling which would otherwise have been unlikely in the face of sometimes vociferous initial opposition. On the other hand, many rules concerning the recycling of specific products may still have to be complied with by British manufacturers if they wish to still access EU markets (whether or not we are in the single market), such as those contained within the revised Waste Electrical and Electronic Equipment Directive, and also pertaining to vehicles and their emissions, and to chemicals. The UK government states in the White Paper its commitment to continue to exercise a leading role in combating climate change, but it is difficult to see how this will be achieved in current circumstances. Generally the UK has, over time, pushed a stricter approach to reducing carbon emissions in the EU than many countries would otherwise have supported, not least the Visegrad countries. As a result, the removal of the UK from the EU may reduce the determination of the largest trading bloc in the world to push measures against climate change- needed now more than ever given the hostile approach of the new US administration. At the same time, the UK’s unwillingness to countenance EU measures promoting specific national targets (such as on the percentage of energy produced by renewable sources) may unblock action in this area. Conversely, the removal of the EU’s second biggest contributor may negatively impact on the funding gap in energy infrastructure, leading to more polluting energy production being retained across the EU than would otherwise have been the case. Other issues are currently open for debate, such as whether or not the UK will continue to participate in the Emissions Trading Scheme. The impact on biodiversity can be split into that on land-based and marine wildlife and fauna, and related to the likely new British approaches to farming and fishing, respectively. It is clear that there are a range of international (as opposed to European) conventions to protect wildlife, from the CITES Convention to the Bern Convention and beyond, in addition to UK national measures such as the system of SSSIs and ASSIs. These would provide some continuing degree of protection to British wildlife. However, the EU Birds and Habitats Directives are stronger in many regards. First, they provide stricter protections for Natura 2000 sites against development than do nationally-designated areas; and second, they also facilitate LIFE funding for conservation measures. Again, the EU’s regulations on Wildlife Trade and Invasive Alien Species offer stronger protections than the CITES convention. Some have suggested, conversely, that the removal of the UK from the CAP regime will promote greater greening of agriculture. Hence, the Government’s White Paper suggests that the removal of CAP from the UK affords an opportunity for ‘new better and more efficient’ farming policies for a ‘cleaner, healthier environment’. It is, however, rather unclear why this should be the case, when (for example) pigs and poultry in the UK receive the least CAP funding and yet are highly intensive. The environmental aspects of the CAP have been legitimately criticised from a variety of angles. Nonetheless, as the dust settles, it is unclear whether the funding available through CAP for practices ‘beneficial to climate and the environment’ – which amounts to almost a third of direct payments to farmers- will come from after 2020. Both the Scottish and Welsh governments look likely to campaign for significant subsidies to be retained by farmers, especially those farming marginal land, who are the most dependent on subsidy; yet this approach may not persist in England. This could have a variety of environmental impacts. If the removal of subsidy leads to marginal and smaller farms becoming unviable, this will clearly lead to the creation of some larger farms, which has been linked to a reduction in biodiversity and increased specialisation, as well as a reduction in the labour force necessary to engage in labour-intensive conservation measures. Subsidy removal could also lead to the abandonment of land and reduction in livestock numbers. This could in theory lead to some rewilding and reduction in methane emissions. Equally, it could lead to the development of relatively undiverse scrubland and not result in any emissions reductions if British consumers simply import meat from other countries. When it comes to the marine environment, the UK has led the way in developing Marine Conservation Zones. Although hailed as a significant step forward, in practice they are weaker in protecting against development than the Natura 2000 system. Again, international conventions do apply, with the Convention for the Protection of the Marine Environment of the North East Atlantic (OSPAR) viewed as having been significant, especially when compared to the UN Convention on the Law of the Seas. In addition, the UK Government states in its White Paper that its new approach to fisheries will ‘want to…deliver a cleaner, healthier and more productive marine environment’, which is encouraging. These may however be over-ambitious aims if the political pressure to allow a more permissive approach in the short term following Brexit overcomes the need to preserve fish stocks over the long term. The fact that research has shown that the UK already has a relatively high average tonnage above scientific advice is therefore rather worrying. To conclude, environmental issues received a relatively low profile in the referendum debate, despite the efforts of politicians, NGOs and individuals from across the political spectrum, from the Greener UK coalition to Stanley Johnson to Mary Creagh MP. Now that the Brexit negotiations have begun, they are continuing to receive little apparent attention from government, with important issues like environmental quality and waste management not even being mentioned in the government’s White Paper on Brexit. Now is surely the time for those concerned about the UK’s environment and climate change to mobilise, for the sake of animals, our planet and our health and that of our children.